I was raised on the outskirts of Palm Springs, California in what we called the “boonies”. We had only three channels on the TV and they came in fuzzy. There wasn’t much to do but wander the desert with my .22 caliber rifle, shooting things, mostly jack rabbits and cottontails. My dad was a gardener to the stars and the elite of Palm Springs. In my formative years, I mowed the lawns of Steve McQueen, Barry Manilow, Liberace and others. The architecture of most of these houses were mid-century modern, and at the time I didn’t appreciate being intimate with these dwellings, but in my older years I think there might be a relationship between my interest in art making and those early life experiences with architectural line, pattern and texture. Coming from a blue-collar background, I assumed I would be doing some form of manual labor job since I was raised to believe that true manhood and labor go hand in hand. By chance, I went to college, took a ceramics class and that changed everything. That first class was the beginning of an art filled life that includes experiences and relationships with the creative class that I never could have imagined when shooting rabbits and mowing lawns as a kid. The arts have enriched my life and the lives of my family and have opened doors that go beyond the dreams of my youth. In 2001 we moved to Toquerville, Utah, a small town in the midst of a spectacular landscape. Our house sits on the road to Zion National Park and the plan was to make pottery and tiles to sell to the passing tourists. It worked, I couldn’t make work fast enough and we met so many wonderful people from all over the world. During this time I was also making sculpture. It turned out that the tourist market for my pottery kept me too busy to investigate sculpture to my satisfaction and my interest in making pottery began to wane. I abandoned pottery-making altogether in 2009 and devoted all my studio practice to sculpture. About the same time, I started teaching at Southern Utah University as adjunct professor. Six years ago I transitioned to Assistant Professor of Art where I teach 3D Design, Multi Media and Ceramic Sculpture. Now we live in Cedar City, a block away from campus. Joining the ranks of academia later in life gives me an added appreciation for the craft of teaching, the academic life and relationships with peers that I admire and who keep me on my toes. My current interest deals with the relationship between sculpture and literature. I am investigating ways in which the additive and subtractive nature of writing relates to the same process as sculpture making. Additionally, I am investigating connections between the visual arts and the literary arts. Do they both create a psychological impact on the audience through similar cognitive channels? Both the visual arts and literary arts have the task of getting into the minds of people. The literary arts are ephemeral, they work when they get into the minds of readers and are then decoded. The visual arts and sculpture deals with materiality and surface. Are there more barriers to accessing the metaphorical minds and consciousness of the viewer when one deals with material? As a visual artist, I am curious whether the same narrative and story telling rules apply to both. I tell visual stories with the use of animal imagery. 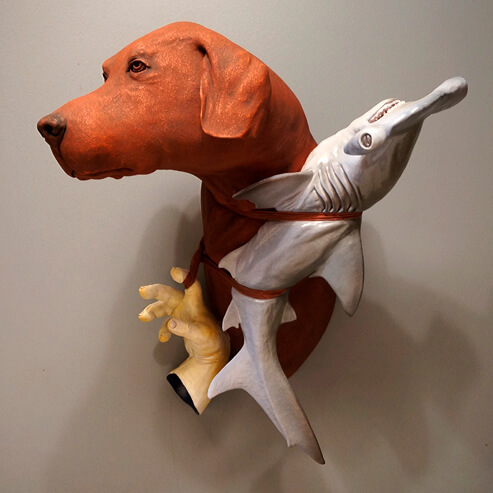 In my work I wrestle with existential questions of life and death through the symbolism of the body and various animals. My intensely saturated ceramic figures represent the decadence of worldly pleasures, a vibrant source of energy that is antithetical to death and dying. It is through embracing life and living that the pull of death and suffering is kept at a distance. Like Aesop’s Fables, animals such as dogs, rabbits, crabs, monkeys and frogs provide a vehicle to express the human condition. Animal imagery is the beginning of a deeper understanding of humanity.